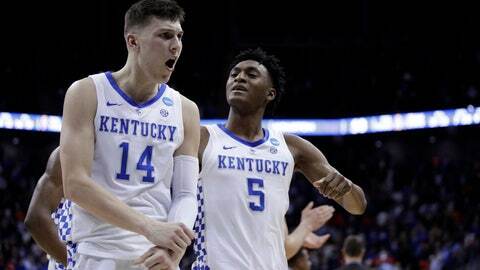 LEXINGTON, Ky. (AP) — Kentucky guard Tyler Herro says he plans to remain in the NBA draft after initially leaving open the possibility of returning to school. Herro was the Wildcats’ No. 2 scorer, averaging 14 points per game. He joins teammate PJ Washington in leaving school early for the draft. Herro thanked Kentucky fans and said his lone season with the Wildcats was everything he had hoped for. Coach John Calipari said Herro was “wired and driven like few other players” he has coached.